Helen Pritchard has 84 articles published. 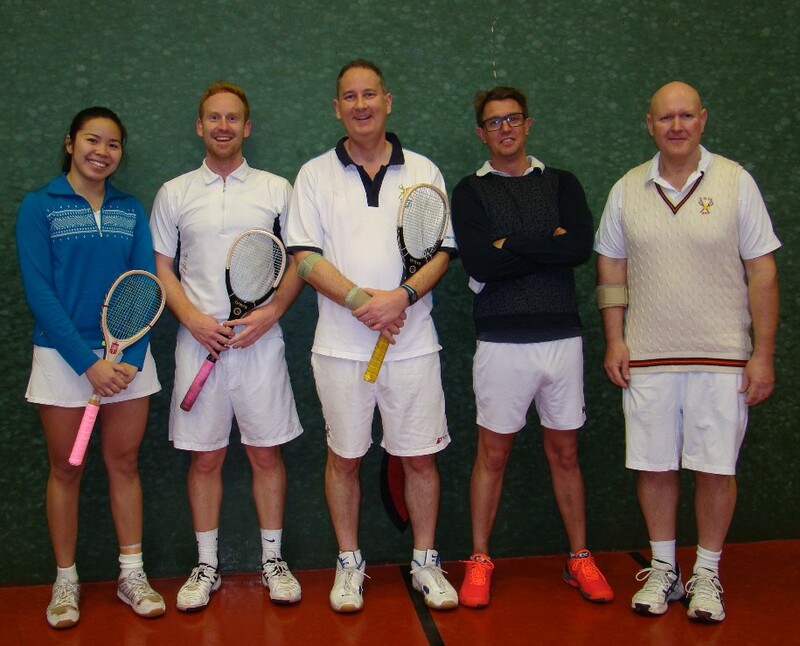 Sydney-siders don’t get many opportunities to play real tennis so on this weekend they make their annual pilgrimage to Melbourne for this big occasion. 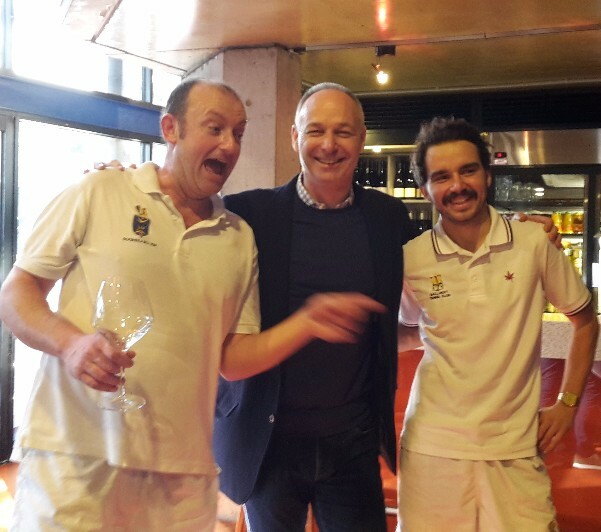 We need an enthusiastic and willing team to take them on and show them real tennis and real tennis hospitality. Sign up in the club or ring the pro shop. Join in the celebration of the biggest day of the year in Melbourne, the AFL Grand Final. Come into the club and start the day with some round robin tennis to be finished by 2pm, then watch the game at 2.30 on the TV at the club. Light lunch will be provided. Ring the pro shop or visit us at the club to sign up. Preparation has started in earnest for this wonderful international tournament. We have expressions of interest from teams from France, the Netherlands, the UK, and the USA as well as RMTC and Ballarat teams. With only a few weeks before entries close, it is time to secure your place in the world’s largest amateur handicap doubles tournament – the 2018 Boomerang Cup and the RMTC Handicap Doubles. Visit the Boomerang 2018 page under Major Tournaments on the RMTC website (www.rmtc.com.au) for a full list of Entry Forms and key activities, or click here for the RMTC members’ entry form. Not in a team or no Doubles partner? If you haven’t got a team or Doubles partner but would like to play, please enter and indicate you want us to find you a team or a partner. What social events are planned for the Boomerang? We will start with a Welcome function in the beautiful surrounds of the club on 8 January (6pm onwards), we will have mid-tournament dinner (with dancing) on 12 January by the Yarra river, and our Final Presentation Dinner will be held on 20 January in the magnificent splendour of one of the finest buildings in Melbourne. Full details of these and other events will be posted on the Boomerang 2018 page over the next month or so. What else is happening in January? The short answer is a lot! Visit the Boomerang 2018 page and look at Advance Notice for some of the key happenings. Get your teams listed now with the Pros for the Boomerang Pennant competition. There will be 4 teams playing Tuesdays starting on 17 October and 4 teams on Thursday starting on 19 October. If you have any questions please contact Tournament Directors Vince Scopelliti and Greg Cornish at boom@rmtc.com.au. 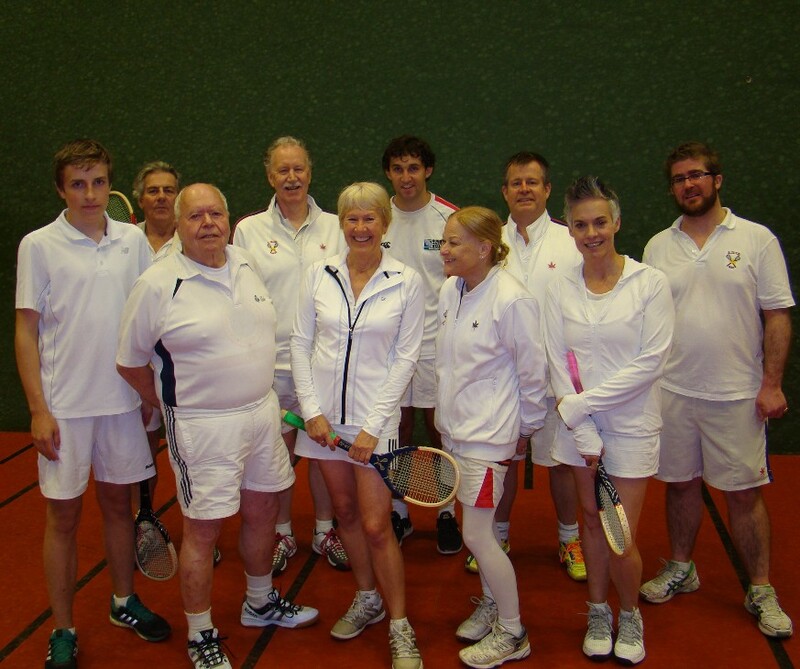 The tournament was played with great gusto by all involved on Saturday 9th. Laughter filled the club. Farouks were gained and used with devilish cunning, and the Gadaffi adaptor was often invoked. More complicated handicaps such as receive ¾ 15, owe ¼ 15 did the markers’ heads in. Two Assyrian deciders had to be employed. 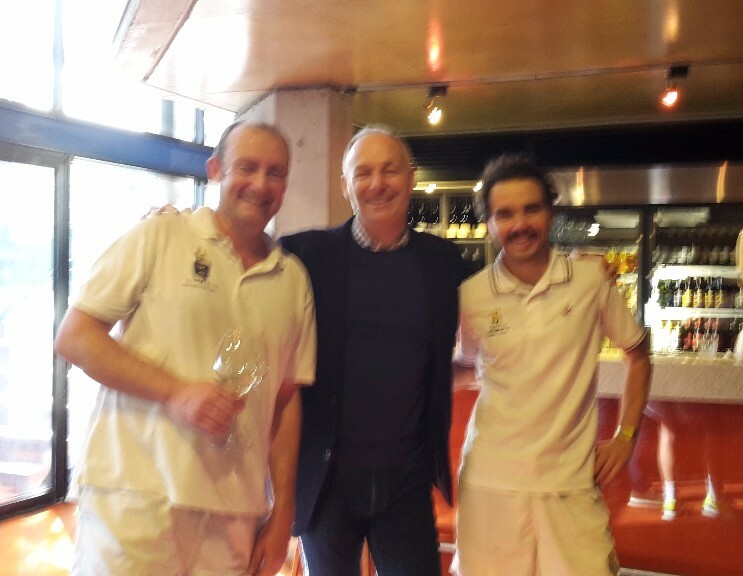 Progressing to the finals were the highly favoured pair of Roland Scollay & Jackson Brand who, after finishing their match at 4 games all, went down on the Assyrian decider to Georgie Lewis & Peter Blomquist. The smart money had been on Lizzie Brown & Julia McCahey, but they lost (4/5) to Ruby Crysell & Stewart McNab in the other semi-final. This set the scene for a fascinating final. Blomquist and Lewis had to give Crysell & McNab owe 30/receive 30. It was 5 all when the bell rang, calling for yet another Assyrian decider, when like a wolf on the fold McNab’s last ball came to rest just on the last Gallery line – winning the tournament. The dedans was as noisy as the MCG at the final siren. Jonners diplomatically summed up the day ”I have never seen tennis like it”. 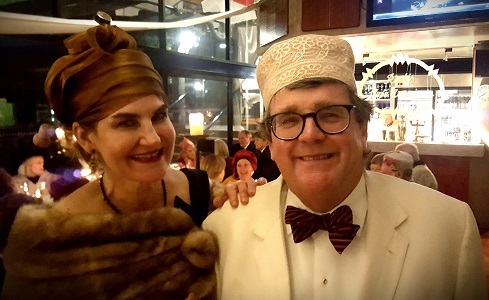 The Feast : The usual suspects were rounded up for the 75th anniversary of the film Casablanca, and the dress code could have been interpreted as come as you were in Casablanca in 1942. The best dressed lady was the still grinning Ruby Crysell (winners are allowed to be grinners), and the prize for the best dressed man went to Robert McCahey. Jonathan Sear, a world expert on chase 4 and 5, spoke on the origins of our wonderful game. Beginning as a temple rite by high priests in ancient Egypt, the game spread through North Africa and the Middle East. Herodotus documents play by the Lyddians. Homer’s Odyssey (book 6) records the first game of ladies’ lawn tennis. O’er the green mead the sporting virgins play/(Their shining veils unbound). Along the skies,/ Toss’d and retoss’d, the ball incessant flies. Sear then went on to point out the echoes of North African tennis to be found in our modern courts. As well as the obvious – sixteen arabic symbols on each court, he placed great importance on chase worse than 8 yards, and the term hazard. Hazard came to Old French from the Spanish Azar (an unfortunate card or dice roll”) which in turn came from the Arabic word az-zahr (الزهر) meaning “dice”. An observer described the address as recondite, others described it as Alexandrian, incomprehensible, unfathomable, impenetrable, mysterious, occult, and cabbalistic. 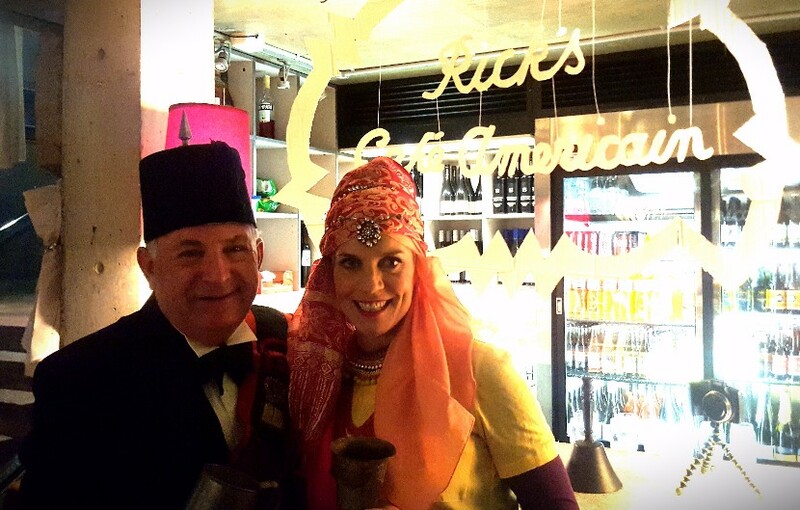 Music was provided by an excellent piano and clarinet combo – perfect for a Casablanca night – & there was dancing and partying well into the small hours – the club had fun. 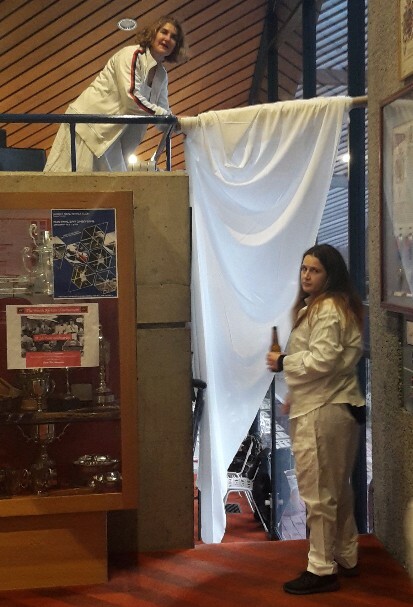 Thanks to Lizzie Brown for making it all happen and, along with Julia McCahey, the hours of preparation to turn the RMTC into Rick’s Bar Americain. At the Australian Amateur Singles Championship, held in Hobart over the weekend, Kieran Booth won his 8th straight title. In the final he defeated Michael Williams in 4 sets, 3/6 6/2 6/3 6/4, in the final having won easily through his semi-final against Al Ramsay from Hobart. In the other semi-final Williams took 4 sets to dispose of Paul Rosedale who is having a very solid year. 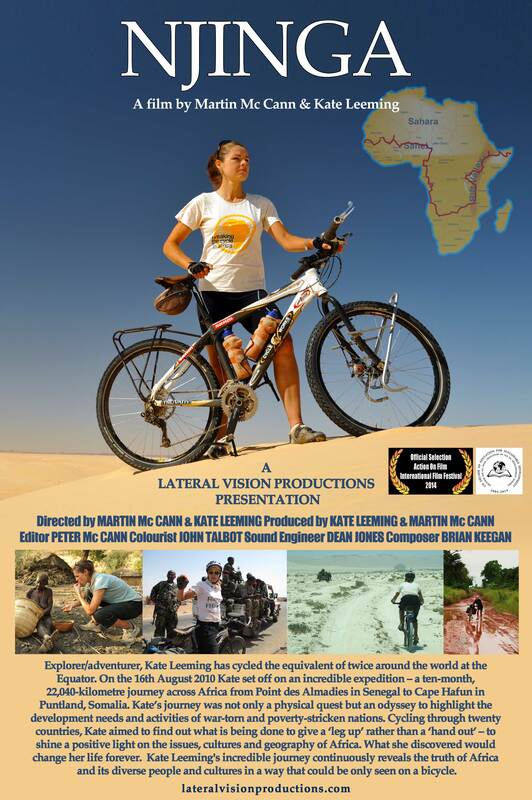 The story of Kate Leeming’s astonishing 22,000-kilometre trek by bicycle across Africa. Dodging rebels, insurgents, Somali pirates, and exotic and dangerous wildlife all while battling extreme conditions. From desert to jungled terrain on non-existent roads and faint tracks, Njinga is more than a story of mental grit and physical endurance, it is a story of hope. The film won Best Documentary, Best Cinematography and was runner-up for Best Director at the Action on Film International Film Festival in LA. All members and friends welcome to attend, even if not a part of the Educhange event. The biggest club tournament of the year is coming up again. It’s your chance to dig out your long-lost family history in the jungles of Peru or wildest Siberia and join with someone with the same (or somewhat similar) connection for a fun day of handicap doubles. Wearing the traditional dress of your home country will garner bonus points and may even see you awarded the coveted “best dressed” prize. Find a partner and discover an interesting connection then come into the club and sign up. Join in the celebration of the biggest day of the year in Melbourne, the AFL Grand Final. Come into the club and start the day with some round robin tennis to be finished by 2.00pm, then stay around to watch the game at 2.30 on the TV at the club. Light lunch will also be provided. Ring the pro shop or visit us at the club to sign up and get involved. 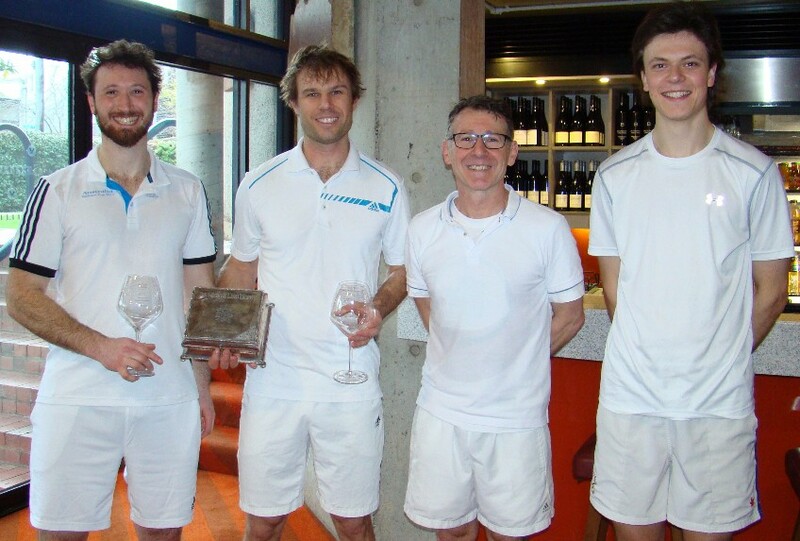 It is time again this January for the Club to host the most prestigious team doubles tournament in the Real Tennis world open to all amateur players, the Boomerang Cup. Alongside the Boomerang Cup, we will hold the Handicap Doubles tournament open to all players so their will be plenty of competitive tennis. Wonderful social events are being planning and several overseas teams have already registered their intention to join the competition. We encourage RMTC members to get their teams together and all those wishing to play need to submit their individual Entry Form by 6 October 2017. Please find the entry forms by clicking here. As an added bonus to get cracking, the Pros are arranging a Boomerang Pennant competition so your team can get match practice before the main event! This will be open to 8 teams – 4 playing Tuesday nights starting 17 October and 4 playing Thursday nights starting 19 October. The Boomerang Pennant will run for 7 weeks (so finishing first week of December). Those wishing to play should register their interest with the Pros ASAP. Please direct any questions about Boomerang 2018 to Vince Scopelliti or Greg Cornish at boom@rmtc.com.au. Along with the usual First Friday Drinks shenanigans, ie. happy hour prices at the bar, good company and engaging conversation, we will be taking the opportunity to welcome Scott Girvan to the social aspects of the club. Scott has been at the club for just over a month now so if you haven’t met him and introduced yourself yet this is your chance. Come and drown the sorrows of a weekend without football with 50 of your closest friends from the RMTC family. The club needs good new members and we ask you to take this opportunity to bring a friend to the club and let us introduce him/her to our great game. Oversize racquets from both Grays and Gold Leaf are now available for trial from the pro shop. All we ask is that you provide your feedback. These racquets will be available for use in social games during pro shop hours, please see the pros if you’re interested in testing one. Last Saturday Fred Kininmonth, Vince Scopelliti, Geoff Dempster, Roland Scollay and Tony Miach ventured up the highway to challenge Ballarat for the Eureka Cup in a best of 10 sets tournament. RMTC surprised the locals with a fast start jumping out to a 3:1 lead with wins to Fred/Vince, Vince/Geoff & Fred/Geoff. The Ballarat team of Rob Jolly, Greg Reid, Stuart Strange, Rod Unmack, Ian Chambers, Rob Lagerberg, Nathan Baker and David Hay rattled off 3 wins in a row to lead 4:3. A 9/7 win to Geoff/Roland levelled the score. The Fred/Roland combination put together a strong 9/4 win leaving our final pairing of Tony/Geoff to win just one game to seal the deal. They did better than that by pushing the BTC pair of Stuart Strange / Rob Jolly to a thrilling 8 all finish, going down 9/8. The end result was 5 sets all, RMTC winning by 8 games (76/68). It was a fun day and we were well looked after by the Ballarat team. BTC professional Andrew Fowler coordinated the event extremely well and provided an excellent set of new balls to play with. If you haven’t played the Ballarat court, or haven’t played there for a while, it is well worth the trip west for a hit. 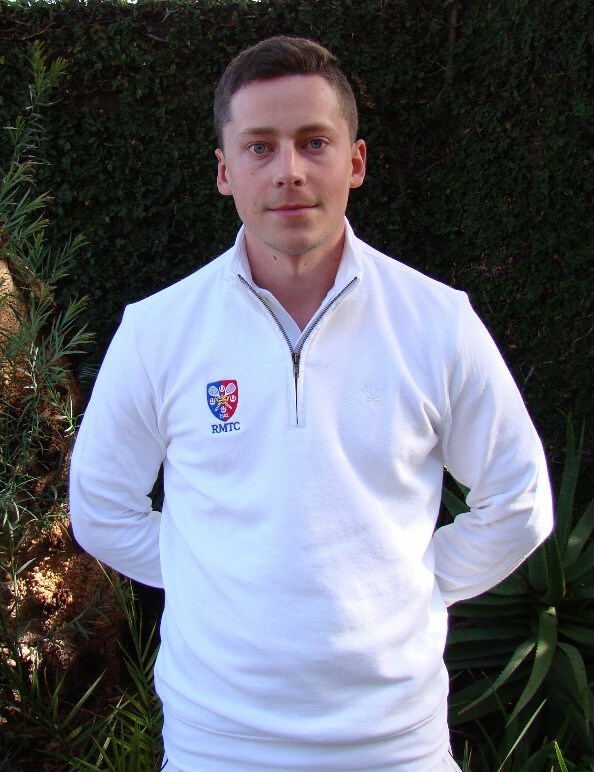 Simply contact Andrew Fowler at BTC on 0401856797 to arrange a game or lesson. Congratulations to Owen Guest (one of the RMTC’s quirks is that if you win a tournament you are asked to write the report, so here goes). 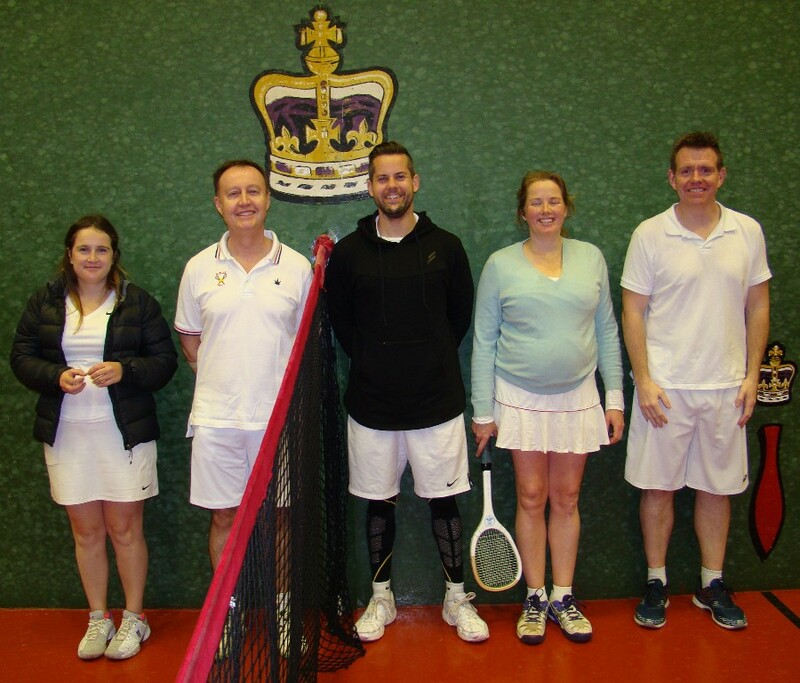 Originally the Mount Ridley Silver Racket, the Richmond Silver Racket is the RMTC’s premier Handicap Singles event (entries are restricted to the top 16 players). The action started on Friday evening when the in-form John Woods-Casey (16.8) fell victim to AUS Clothier representative Jackson Brand (35.8) in three sets. Other matches included CJ White (playing off 13.6) accounting for Frank Filippelli (1.0) and Paul Rosedale (10.3) doing very well against Andy “Big Red” Fowler (8.2), sending him back to Ballarat with his tail between his legs. Come the semi-finals CJ didn’t waste time in accounting for Rosedale (6/1 6/3) and on the other side Owen Guest took a while to warm up before ending Jackson’s run (2/6 6/0 6/2). The final saw CJ aiming to become the event’s first three time winner but within a few games this started to look unlikely. In the first set, Owen’s mix of serves made it difficult for CJ as he could neither go around him nor through him. In the second set CJ had a few chances but from 3/3 Owen closed out the match with a series of aggressive service returns, heavy breathing and committed running (Final Score: 6/1 6/3). Please note, the Larwood Cup has been postponed with the date to be confirmed. Get your ski gear together, it’s time for the biennial RMTC roadtrip to that well known winter destination Ballarat. We will be sending both women’s and men’s teams and it promises to be a great weekend of tennis and merriment. Sign up early. The club needs good new members and we ask for your help to raise awareness of the game with your friends and colleagues. Take this opportunity to bring a friend to the Club and let us introduce him/her to our great game. The biggest club tournament of the year is coming up again. It’s your chance to dig out your long-lost family history in the jungles of Peru or wildest Siberia and join with someone with the same (or somewhat similar) connection for a fun day of handicap doubles. Wearing the traditional dress of your home country will garner you bonus points and may even see you awarded the coveted “best dressed” prize. Find a partner and discover an interesting connection then come into the club and sign up. 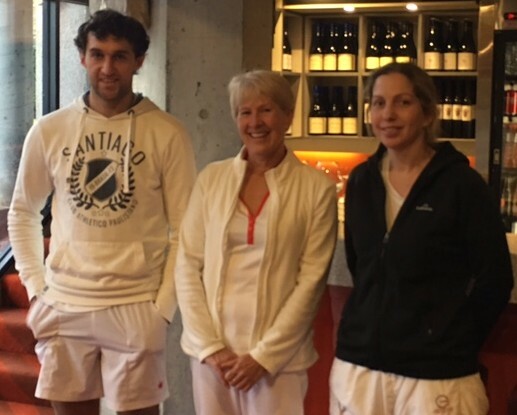 Sydney-siders don’t get too many opportunities to play real tennis so when this weekend comes around and they make their annual pilgrimage to Melbourne it is always a big occasion. We need an enthusiastic and willing team to take them on and show them the ropes of the club. Sign up in the club or ring the pro shop to get involved. Could all members please be conscientious of printing names and dates clearly and legibly on bar chits as Helen will be away and her replacement, Kat Hamer, may have a little more difficulty deciphering the peculiarities of our handwriting. The online booking sheet is back up and running, you can now see the booking sheet and make bookings again. Many thanks for your patience and apologies for any inconvenience it caused. Another successful day of handicap singles action was enjoyed by all 20 players in the latest episode of the quarterly medal. The winners on the day, all coming through very strong groups, were John Moran, Dominic Emery, Tim Raw and Ruby Crysell. Tickets selling fast, only 3 spots left! Call the pro shop ASAP to make sure you don’t miss out. Could all members please be reminded that it is polite to not walk down the side of the court while play is underway but wait until the players are changing ends. This extends also to being stationary in the dedans during a rest. Many thanks for being courteous to all other players. On Saturday 22 July MCC hosted RMTC in an annual tournament between the two Clubs in Ballarat. We enjoyed a great day of tennis. Although I have to admit we knew it would be a tough battle from the outset when we saw MCC had stacked their team full of Ballarat members! Local court knowledge proved decisive as MCC powered to a 5/3 victory. Alan Willingham put in a best on court performance for RMTC with two wins, one with Vince Scopelliti and another with Fred Kininmonth. 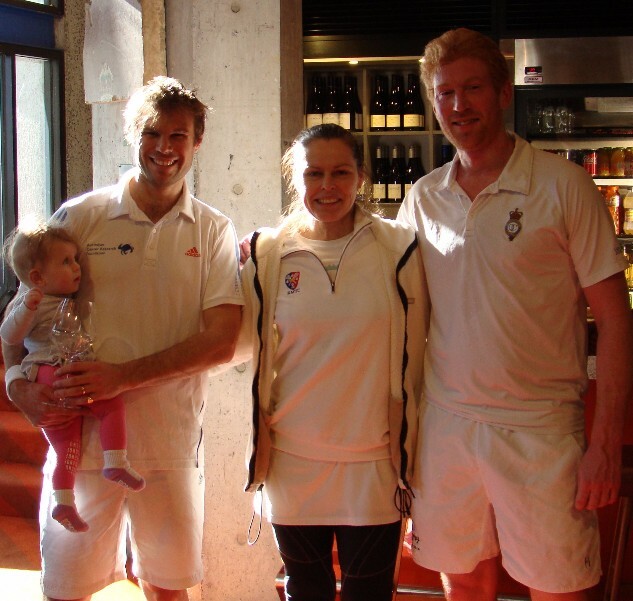 Annie & Geoff Dempster closed out the day with a fine win in the last match to finish on a winning note. Thank you to Roland Scollay and Ian Bull for also travelling up the highway to play for RMTC. Congratulations to the MCC team consisting of Anne Strange, Jim Stephen, Greg Henderson, Jo Edwards, Stuart Strange, Greg Reid, Yvonne Rout, Rob Jolly and Tim Raw. Thanks to Tim & his helpers for arranging lunch. It was also good to see MCCRTS president Andrew Gould and Merrin Mackay supporting from the warmth of the club rooms with Nathan Baker, Cath Collins and Wendy Whitehead dropping in throughout the day. The Ballarat Tennis Club shares the ground of the Mecure Ballarat Hotel & Convention Centre, where a dinner was held to welcome new professional Andrew Fowler and his partner Maria. Andrew has worked at RMTC, NYRTC and Queen’s Club amongst others in a fine career. He grew up in Ballarat and it was clear from the 60 guests gathered there that it was a hearty welcome for a returning favourite son. None were happier that evening than Andrew’s parents Graham and Cathy Fowler. It was also announced that Stuart Strange would be handing over the presidency of BTC to Nathan Baker. 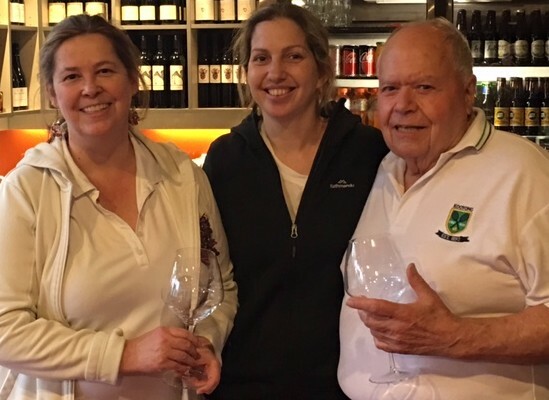 Stuart has been a big supporter and promoter of tennis in Ballarat and a frequent visitor to play at RMTC in various inter club and Boomerang tournaments. Thank you Stuart for your contribution to the game and we welcome Nathan in his new role as president of BTC. The Victorian Open was held this past weekend with the first round matches played on Friday night. The semi-finals of the singles went as the handicaps suggested they should with Kieran Booth overpowering CJ White 6/2 6/0 and Andrew Fowler coming through a strong performance from the improving Paul Rosedale winning 6/5 2/6 6/2. In the doubles the local pair of Frank Filippelli and John Woods-Casey proved too consistent for the Ballarat pair of Fowler and White winning 6/4 6/2. The finals went as scripted. Kieran and Paul were too strong for Frank and John despite a very close first set, after which Kieran took over the match and put the result beyond any doubt. The final score was 6/5 6/0. Kieran also took out the doubles in a dominant display over Andrew winning 6/2 6/0. Congratulations to Kieran on winning his fourth consecutive Victorian Open singles and doubles titles and fifth total doubles title.